The Palexpo Locarno organises and hosts various kinds of events and is owned by the City of Locarno. The multi-purpose hall (salone multiuso) on the ground floor is particularly appreciated for its capacity with a surface area of 2100 sqm which can host up to 3200 seated people. Thanks to its versatility, for it has no inside infrastructure and is therefore easy to furnish, the “salone multiuso” is suitable for congresses, banquets, exhibitions, sports events, fashion shows, launch of business products, shows, concerts and film projections. Furthermore, smaller rooms on the first and second floor as well as a restaurant are part of the offer. 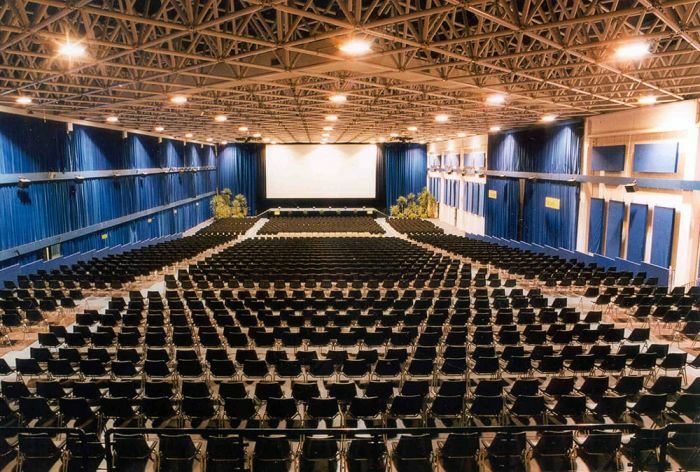 The Palexpo Locarno is air-conditioned and equipped with high tech technology. During the Film Festival is transformed into one of the world’s biggest movie theatres and hosts the official screenings of Locarno's International Competition. I Legnanesi - 70 anni di risate!